I am going to be in San Francisco the next two weeks for work. As soon as I got back from Ithaca, I packed my bags and flew out. Joel is here too and Tina joins us tomorrow. We have a lot of work to do, but we hope to get around a little too. 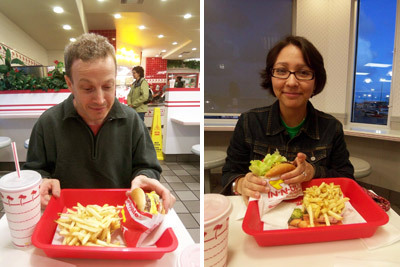 Joel and I have already hit the In-n-Out Burger. Yummy, yummy. Anyone have any must visits? Here are some East Bay places if you get over there. If you are in the Temescal district in Oakland, try Pizzaiolo. Swan Oyster Depot, also on Polk, always gets raves and always has a line. Best Thai food in town, in my opinion, is at Osha - the original at Geary and Leavenworth. Hopping even at 3 am. The Garlic & Pepper is awesome as is the cucumber salad and the vegetarian egg rolls. If you go here wave to me - I live a block away. Next door to Osha is Rye - one of the in bars for the moment. Pancho Villas in the Mission for real Mexican food. On 16th at Valencia. EXCELLENT breakfasts - also always a line - Dotties True Blue. On Jones at Geary. Another breakfast option is the Pork Store on Haight at Masonic. All sorts of good places down in the Castro - just walk the street and look at the menus. I've been meaning to get to the Presidio Social Club - their menu looks really interesting - haven't made it there yet. It's over in the Presidio near the Lombard Gate. For sweets, Ciao Bella Gelato in the Ferry Building. YUM! Oh and Friday night a great "band" (they're doing a DJ set), VHS or BETA is playing at Rx Gallery. Eddy @ Mason. Last one I promise (can you tell I lose my town?) - if you can get there definitely check out the Audium. And there's a Picasso exhibit at MOMA if you're into that sort of thing. Well done on already hitting In n Out. As a native Californian, I am always trying to get out of state visitors to belelive me that they have the best burgers. Hands down! Did you go animal style? Or how about a neopolitan shake? Dude, the Cheeseboard has the best scones on the planet. Also, you know there are Beard Papas there, right? Plus the Daiso Japanese $1.50 stores? And if you find yourself in Hayes Valley in SF, there's a Miette candy store plus a Blue Bottle Coffee plus Suppenkuche, a super yummy restaurant. You can find good chocolates and yummy foods at the Ferry Building Marketplace, too! Have fun! If the weather cooperates, i think you'd appreciate the mosaic stairs (16th Ave @ Moraga) below Grandview Park in the Sunset District just east of Hwy 1/19th ave The stairs are beautiful and the views from Grandview park can be great (or foggy). I also recommend the Reuben sandwich at The Irish Bank downtown(on Bush between Grant and Kearny...just down the street from the Chinatown gate).Yum. Or the shepherds pie. Yes! The Hagiwara Tea Garden in Golden Gate Park! It's one of my favorite places in the country. Where exactly in SF will you be? Le Colonial (20 Cosmo Place, SF) has great French Vietnamese food... try the sea bass! Salt Box which just opened recently has good food too but may be slow in service... on 2nd and Mission a few doors down from Roy's (which is also very good for Hawaiian fusion food - try the ribs and butterfish!). If you haven't already been, and the weather cooperates (which it should) go to Alcatraz. I know it sounds hokey, but it's interesting and the views of SF and Marin cannot be beat! If you like fabric and notions, Britex is worth a visit. For unusual yarn, ArtFibers on Sutter. Finally, will you have a car? There are interesting things to do in the south East Bay as well, but a car is needed. Miette's Cupcakes at the Ferry Building! Yummy organic treats! And for some added fun, Ciao Bella gelato is just a couple of stalls down. Clearly, as the above comments would suggest as well, you have to go to the Ferry Building in SF. Go for the cupcakes at Miettes, the farmers market, the oysters at Hog Island, the dumplings at the Imperial Tea Court, sweet potato fries at Taylor's refresher - you could spend days grazing there. Plus it's historically interesting as one of the few public buildings to survive the 1906 earthquake/fire. Head over to Menlo Park (about 30 minutes out of SF) and visit the Allied Arts Guild (http://www.alliedartsguild.org/). It's beautiful! Stunning gardens, lemon and orange trees, Spanish influenced design. Then head over Myake (great sushi) or maybe the Cheesecake Factory (!) on University Avenue in nearby Palo Alto and finish off the afternoon touring the grounds at Stanford University. It's actually in San Jose, but worth the side trip if you have time. Eat Sausage at Rosamunde's and drink beer at the Toronado in the Lower Haight. Rent a Bike and bike across the Golden Gate bridge and down into Sausalito. Take the ferry back. Those mosaic stairs someone mentioned are awesome. I disagree on the best Thai place. I like Thai House Express http://www.yelp.com/biz/vKBW6SWFrIYXW1kIOFY_Ng better which is right down the street from Osha. For a nice hike but still in the city I'd go over to Land's End. http://www.yelp.com/biz/yniMfk_yS1sk9dxPLDVchg You can see sutro baths from the start which is pretty neat. I second Miette cupcakes in the Ferry Building and Britex. if you have any questions drop me an email! hi jenny! looks like you already got lots of suggestions...here are a just a few: mitchell's ice cream on san jose ave. has lots of great flavors, i love the mexican chocolate, macapuno (with a chocolate dip) and pear sorbet... blue plate, which is near there, is one of my new fave restaurants...if you like french pastries, check out tartine bakery on guerrero st. for almond croissants, bread pudding, banana cream tart, just about anything there is amazing! hope you're enjoying your visit! Hi Jenny! Welcome to the Bay Area-sorry about the hail. Fillmore Street for Paper Source and it's up the hill from Japantown and the Kinokuniya Stationery & Bookstore, been to Coit Tower yet? If you love garlic...try the stinking rose restuarant. At the Ferry building, we usually go to Taylor's Refresher for an ahi burger and a mint chocolate chip shake, then follow that up with goodies from Miette for later! I was also going to suggest the Picasso exhibit. Have you been to H&M? I love Pluto's for salad and some grilled chicken. There is one on Irving near 9th and one in the Marina. For Fabrics and/or art supplies I like Flax on Market near Valencia and Mendel's Far Out Fabrics on Haight. Clement Street near 5th in the Inner Richmond is a mini Chinatown and has a fun Asian restaurant supply and houseware store called Kamei. They have everyting! This area also has Green Apple Books with a great used selection. I like to walk on Fillmore Street starting at the JapanTown on Geary and then walk North to Broadway. There are lots of arty shops and coffe shops. Plus a Paper Source (there is a larger store in the Marina.) Alas The Brown Bag is no longer in business. The view once you get to the top of Fillmore is fantastic. Another great thing to do is explore SFs stairways. Adah Bakalinsky's Book: Stairway Walks in San Francisco has great directions and maps. A restrospective exhibit of Vivienne Westwood fashions, if you're into that sort of thing! And Japantown, since you have such an eye for cute things! There's a place there with the most delicious mochi I've ever tasted. Lucky Creation Vegetarian 854 Washington St. (Near Stockton) 989-0818 It's teeny so don't blink too much while you are looking for it. Order anything with clay pot in the name (I like the eggplant). Cracker's resturant in the downtown area is amazing for all meals and is not pricey. Coit Tower is a beautiful view and the murals inside at it's base are glorious. It is best to take a bus or tAXI up then hike down--only 20-30 parking spots are up there. Then, after the long hike down, you end up in North beach--the little Italy of the city. Also the famous City Lights Book store is there, where "Howl" was first recited. If you head to the Ocean side of the city, Beach Chalet is along the western border of the Golden Gate Park, near the 2 windmills. Was built in 1925. The first floor is a visitors center, with amazing old murals that tell the history of the city. The food can be pricey for dinner, but the views are great. The beach/dunes are just across the street--nice place to watch sunset from, but bring your coat--will get chilly. The walking tour of China town is fun, as well as the street car museum--which is a stop on one of the lines. Mission Delores in the Mission district is a beautiful church with the oldest and only cemetery in the city. The way they decorate The church for palm sunday --made me cry. The mission church is amazing. The New church is next to it. the cemetery is a trip though the early history of the area. Barney's Burger's are great with several locations--veg and meat offerings. French fries in giant portions! Louie's by the Cliff house, along the ocean is a breakfast/lunch diner with great views of the ocean and the Sutro bathouse ruins--family owned and run for generations. Cheap eats and a bus stop right in room. Behind it is the start of several hiking trails along the coast--great views. We hiked to the Legion of Honor--great collection of bronzes by Rodin--including a copy of the Thinker. The inner child will love the Exploratorium, by the Palace of fine Arts--featured in such films as "The Rock" and Time after Time". Avoid Pier 39--waste of time, except to see the sea lions and seals, that have taken over $$$$$$ habor space to bask in the sun. Golden Gate Park is beyound words, and you could spend a week exploring all of it. The Japanese tea Gardens ranble on, in zen fashion--path change texture and direction to please all your senses. the chery bloosoms should still be in bloom there. Get your picture taken on the drum bridge. A walk across the Golden Gate is always a must, the Muni has buses that run there during the day. expect to see armed soldiers making rounds. A shopping afternoon can be had in Sauiltio--by ferry and a free local bus caters you around. Also there is the famous houseboats and the Bay Model--a must for my nerd of a husband. I have not been there for 4 years and cry everytime I leave there. Never enough time to take it all in. Check out yelp.com for reviews of everything. Hvae fun! The Grand Lake theater in Oakland, is a step back into time--to the grand movie palaces of old. Oakland has a great museum on the lake, a major migriatory stopping site. Oooh oooh go to Hunan Home's in Chinatown for some seriously good orange peel chicken. Seriously. Never been to San Francisco, but i heard there is a 4 level Sephora there. That would definitely be on my must-see list. Also, if you are a clothing bargain hunter, and want to see where new and salvaged discount jcrew, anthropologie and some designer clothes can be had, check out Jeremy's. There is one in Berkeley, at the corner of College and Ashby (caters to a more college crowd, so has more jcrew and anthro stuff). There is one in SF at 2 South Park that is higher-end designer, with a mix of jcrew and anthro too. Women's, men's and shoes. www.jeremys.com. Oh, I forgot to mention: Swan's Oyster Depot. Best seafood in a hole-in-the-wall place. All seating is at the counter and it's a true SF experience. Ooh, welcome to the Bay Area, Jenny! Head through GG Park to Ocean Beach and have dinner or drinks at sunset at the Beach Chalet - it's in a cool old building that has a big mosaic going up the stairs. Have you been to Flax downtown? Great art papers. Myconos food (mentioned above) is great. Also Green Apple Books (2 floors of new and used books) on Clement - it's in a heavily Korean neighborhood that's fun to roam. You can go from there to the Legion of Honor out by 24th. greetings from the big island of hawaii! as a native bay area-n - you must eat at RUDY'S CAN'T FAIL CAFE... its my brother's favorite! and its owned by one of the members of Green Day! hopefully i'm not too late and you get a chance to grind here! you must eat breakfast/lunch at mama's cafe at washington square. it is located in/near north beach at stockton and filbert. there is usually a long line and they only take cash, but it is well worth all the trouble. they have really good monte cristos, coffee cakes and benedicts.